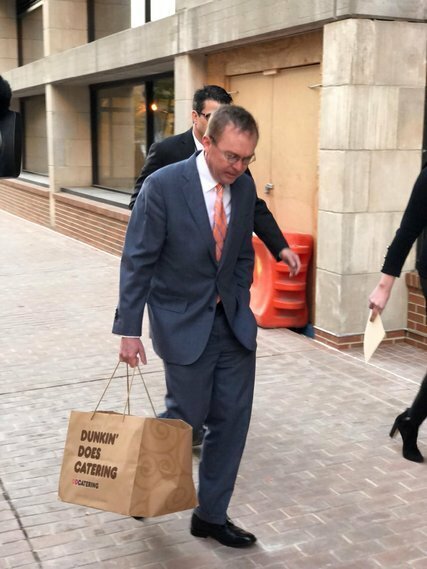 Mick Mulvaney headed to CFPB this morning with a bag of doughnuts. Two different people believe they are head of the Consumer Financial Protection Bureau this morning. Mick Mulvaney, the acting director of the Consumer Financial Protection Bureau, brought in doughnuts. Around the same time, Leandra English, the agency’s other acting director, sent an all-staff email thanking employees for their service, reports The New York Times. the president decided on a permanent successor, whose confirmation could take months. And on Sunday evening, Ms. English filed a lawsuit against President Trump in an attempt to block him from appointing Mr. Mulvaney, who is named in the lawsuit as “claiming to be acting director” of the agency. As confusion reigned, Ms. English headed to Capitol Hill to meet with lawmakers about her plans. Among those lawmakers: Senator Elizabeth Warren, the Democrat of Massachusetts who proposed the bureau and helped set it up, according to a spokeswoman for Ms. Warren. Mr. Mulvaney, for his part, dodged questions from consumer finance advocates as he carried in breakfast for at least a few employees on the 1,600-person payroll. There was no public trace of Ms. English, whose tenure as a low-profile public servant abruptly ended as she began to fight on behalf of the agency she helped found in 2011. As I noted in an earlier post, I prefer Mulvaney. He would likely take a wrecking ball to this Elizabeth Warren-inspired fascist agency. Why do you continue to read and quote the NYT? The best outcome (short of shutting this beast down permanently) is the prospect of a long lawsuit during which the agency is unable to function. Perhaps at the end of that period people will either conclude that the agency wasn't missed, or that things got better in consumer finance while it was dormant.